I winter sowed my first flat today, with Cypress vine (Ipomoea quamoclit), kiss me over the garden gate Polygonum orientale, Sea holly (Eryngium giganteum 'Miss Willmott's Ghost'), and larkspur (Delphinium elatum 'Magic Fountain Cherry Blossom'). I didn't have other containers ready, or I would have sown a lot more. 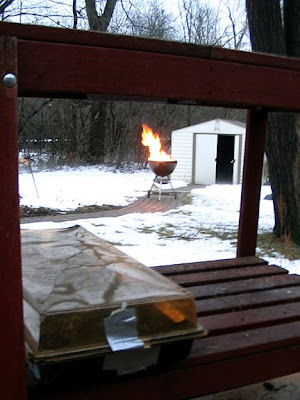 After planting in late afternoon, I spontaneously lit my bonfire, which was too windy to start on December 21. Doesn't the winter-sown flat, on a workbench on my deck, look nice against the bonfire happily burning in the background? While winter sowing, I realized I have too many seeds. Mind you, that realization did not stop me from ordering 18 more seed packets today from Value Seeds, nosirreebob. I bet a lot of you are in a similar situation: You simultaneously have too many seeds, yet you want more seeds, too. So I propose that we pass them along to each other! That way you can get rid of some of your extras, and pick up something new to try. I'll host a round robin seed exchange. Here's how it works. Everyone emails me their postal address, and I'll divide people into small groups (yes, European friends can participate; I'll try to group you together to save on postage costs and time). 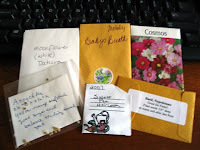 I'll start the swap for each group by placing a dozen or more types of seeds, in little packets, into a padded envelope. I'll also make a numbered list of the other people in each group, and send the list, along with the seeds I'm offering for the swaps (did I mention I have some awesome heirloom tomato varieties from Ann Arbor tomato guru Royer Held? ), to the first person on the list. When the envelope arrives, that person runs gleefully from the mailbox into the house and takes out any seed packets they want, replacing them with the same number of seed packets for the next person. Then they send the packet on to the next person on the list, ideally within a few days, and so on until the last person sends it back to me. I'll then pick out my share of seeds and donate what's left over to a local community or school garden. You can use any kinds of seeds (veggie, herb, native, showy, perennial, annual, biennial, woody, whatever), and enclose any amount of seeds per packet. (If you have a lot of seeds, perhaps you can divide them into multiple envelopes.) You replace seeds by the number of packets you took, not the number of actual seeds. (It's also OK, for example, to take 6 and replace 5, or to take 5 and replace 6. Use your own judgment.) You can use any kind of envelope or packet to hold your seeds, whether the original seed packet or one you made yourself. You need to label the seeds by name and color, plus anything else you find helpful. The photo shows examples of packets used in a previous swap, though there'll be a lot more of them in the actual envelope you receive. I'll also enclose directions with the swap, plus you'll be able to see how others packaged their seeds by the time the packet reaches you. I've participated in this type of round robin before, and it's a lot of fun! To join, email your name and postal address to me at gardenfaerie02 at yahoo dot com (removing the spaces and replacing "at" with "@" and "dot" with ".") by Friday, January 9, 2009. I know this deadline seems early, but it takes a while for the packages to make their rounds and I want to accommodate those who winter sow. If you're interested but don't have seeds yet, I could push out the deadline a few weeks. Let me know! This sounds like so much fun. What a great idea. Monica, a great idea. I don't have any seed yet but am planning on starting soon. Sign me up! Thanks for visiting my blog today :) The first photo in my post is actually a lupine coming up in early spring. I don't have nearly enough seeds yet :) We just got started with indoor seed starting last year and it was a lot of fun! Hi Monica, Thanks for your offer to send me seeds for grass for my plant-eating kitty;) I have purchased grass at Petsmart several times, and he does eat it. I know he would love it...but, he's an indoor cat, and he has some issues that cause him to throw up more often than normal; then, when he eats the grass he gets even worse in that way. I learned that having it around may be fun for him, but it's not really a good idea. So, though it is a really nice gesture on your part, I will pass on it...but I want to thank you for your kind offer!! Hi Monica, good luck with your winter sowing. I have never had any luck. Tried it several times. In May and June my containter is still sitting there without a sprout. Hi Monica, count me in! Wish I could, but I'm going to pass this year. I can't handle thinking about another thing, right now! :-) Way to go, though!!! I do have a few seeds that I want to winter sow! ich wünsche Dir und Deiner Familie einen guten Rutsch ins hoffentlich gesunde und glückliche 2009. Auch ich habe bisher nie Glueck mit Samen gehabt:( Egal, ob ich es vorher im Haus versuche oder direkt draussen ausstreue. Mittlerweile kaufe ich nur "fertige" Pflanzen. Monica, This sounds like a fun idea. I wish now I had collected more seeds from my garden as I had intended. Do they have to be seeds you've collected or ones you may have gotten from a seed company that you don't need? I wasn't very successful in starting plants from seeds last year, but I think I learned from my mistakes and am willing to give it a go again this year! Thanks for signing up and linking to this post from your blog. Well, there's a little time left yet! I'm keeping winter sowers in mind, and it does take a little while for the envelopes to circulate. The cat seed I use is organic and I find my cats throw up less eating it--though they do eat grass to activate some enzyme that gets rid of hairballs. I appreciate you not wanting to clean that up! This is either the fifth or sixth season I've been winter sowing, and it's always worked for me. Not every seed germinates, but I've had just as high a ratio as when I did indoor seed starting. You do have to monitor for water levels, and then ventilate the containers once sprouts start, but to me that's still a lot less work then indoor seed starting. I'm feeling a little overhwlemed with things to do, too. I know just how you feel! Yes, I like having something gardeny to do in winter... and in spring, the seedlings don't all come up at once, as they're blooming on their own natural schedules, so things are transplanted in waves, which is manageable. Nun ist 2009 nicht mehr weit weg!! Ich kaufe auch "fertige" Pflanzen, mag aber gern auch von Satt anfnagen; fand es drinnen aber zu viel Arbeit. Es freut mich die kleinen Pflaenzen zu sehen! Ich kann aber auch verstehen dass es zu viel Arbeit sein kann. Birgit hat gesagt, "prost" ist Norddeutsch und "prosit" Sueddeutsch, and dass passt zu meiner Bemwerkung das meine Mutter (aus Hamburg) immer prost sagt und andere Verwandte aus Ludwigsburg prosit sagen. Also prost/prosit new Jahr!! I'm always so pooped by fall I don't always remember to collect as many seeds as I'd like. But my ironweed and rattlesnake master both still had viable seeds even now (I don't cut down stalks until spring). Also, it's fine to use leftover seeds from packets--I'll be using both self-collected and bought seeds in the swap. I'm trying to curb my seed appetite for the moment, but it's a great idea! I'm chuckling about your camera LED not working in the post below. It's easy to hit those buttons by mistake, or turn the mode switch. Once I accidently made a movie of wildflowers..and heard myself talking to the camera, "What are you doing? ", I asked. It took me a minute to realize what was happening...chuckle. Like your mom, I miss going to the beach in Australia at Christmas too. We have 4 inches of new snow here this morning! No swimming today! Wishing you joy and many blessings for the new year. I have tons of seeds and this sounds like fun! 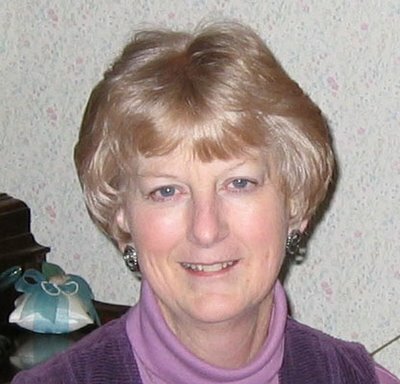 Hi Monica - I took part in one of these last year and it was great fun. I'll probably have seeds left over from my Open Garden once I've sent off the packets to my deserving donors. There's probably enough for both a European Round Robin and to bolster your starter pack. I could even throw in a packet of (bought) parsnip seed seeing it looks like it's an unknown vegetable in the USA! I'll be posting the definitive guide to this vegetable next week. My email address is on my blog (bottom right sidebar) if you need to get in touch. Hi Monica, I have to admit that I've never tried winter sowing. I'm starting to suffer from cabin fever, so maybe I'll give winter sowing a try this weekend. Thanks for the great info. LOL, I too accidentally made a movie (in June at the Denver Botanic Gardens) but didn't realize what had happened until months later. I'm funny! Thanks for your generous offer. I haven't in fact gotten anyone outside the U.S. (not even in Canada!) to sign up, so I'm not going to need the seeds. Now, if you have some parsnip seeds just for me, I wouldn't say no! Would you like some heirloom tomatoes? Winter sowing is a lot of fun. Are you my "local" WCC Catherine? ?